I haven’t done lunchbox post in absolutely forever. Many because I’ve been naughty and lazy and started going out to buy lunches while I was at work. This is not so good for the purse strings and depending on where I’m working sometimes the most exciting option is a pretty limp Tesco’s sandwich, whilst some are fine, I’ve never been that huge a fan of supermarket lunch options. The sandwiches/pasta salads/ wraps all taste rather suspiciously similar no matter what the filling. So we’re back on track and making exciting lunch boxes again, yay! My lunch boxes are often a mix of salads or falafels and dips with pitta and other, what I like to refer to as ‘snacky bits’. However one of the best ways to fill up your lunchbox is with leftovers! It doesn’t involve having to buy extra stuff and if you’ve had a particularly good dinner then you get to relive the whole thing again the next day. I don’t always just shove my leftovers straight into a tupperware though. It can be a little more interesting to mix it up and turn your leftovers into something completely new. In this instance I’d been to my Mum’s for a barbecue on the Sunday and come home with tubs of various leftover salads, meats etc. I used some houmous to spread on the wrap. 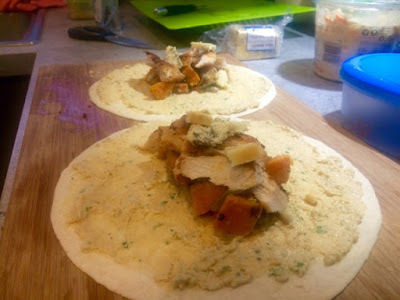 When making wraps I always spread with something that will help stick the tortillas together when it’s rolled up to make for easier wrapping. Cream cheese is my staple but dips work brilliantly too. For the bulk of my filling I piled in some leftover roasted sweet potato, shredded up some chicken and crumbled a little blue cheese on top for bit of extra flavour. I also had plenty of chicken left to do a chicken and salad wrap the next day. I’m now thoroughly back into the swing of packed lunches so I’ll post up some more ideas for you soon.